As a result of Senate Bill Number 3, passed by Jerry Brown back in April of this year, California has begun its ascent to reach a $15 minimum wage by the year 2022. 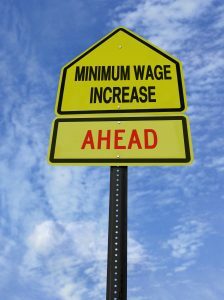 California’s minimum wage reached $10.50 on January 1st, 2017 for businesses with 26 or more employees, but smaller business will see their first rate hike on January 1st, 2018. The state-mandated, January 1st increase in minimum wage will not affect certain municipalities that are already at a rate higher than the state minimum, including but not limited to Los Angeles, Pasadena, Santa Monica, Emeryville, and San Francisco; however many of these cities and counties will have their own increases that they will be rolling out between January 1st and July 1st.